I don't often *gush* over anything, or anyone; except when it comes to out-of-this-stratosphere recipes (and Tom Hiddleston). 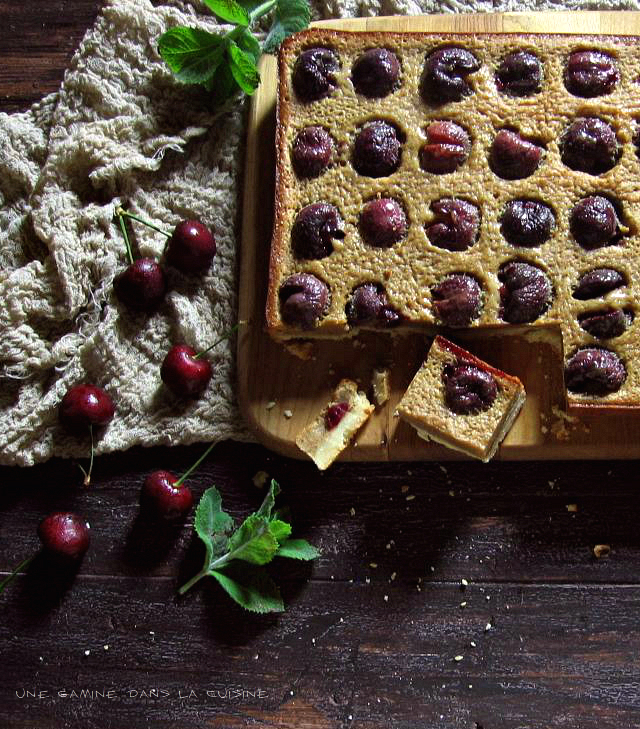 I'm flushed with adoration for these cherry bars. They're absolutely ambrosial! 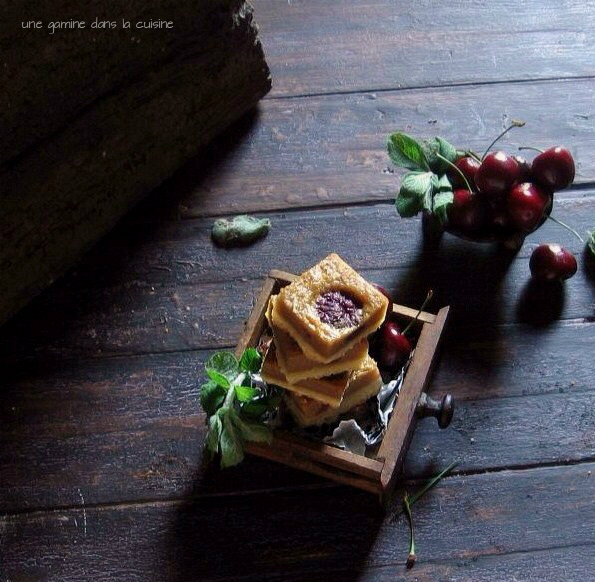 Various incantations of this recipe have made their way around the food blogosphere - I doubt there is a wrong way to go about creating these cherry-bejewled squares. They have a buttery shortbread cookie crust: I added almond extract and fresh, bruised basil to mine but I'm curiously anxious to give piney rosemary a try (next time!). The filling is a lush almond-ine mixture of brown butter, eggs, and sugar, it whispers of marzipan but feels more akin to a buttery custard. Fresh cherries, with their sweet, juicy dispositions, are the perfect finishing act. Aside from a citrus infatuation, I've always been enchanted by all things almond and cherry. When I was little, I imagined the moon was encased by marshmallow clouds that rained warm almond-cherry milk. These bars made my inner child wild with almond-eyed excitement. Prepare the crust; preheat oven to 375 F. Line a 9x13-inch baking pan with parchment paper or tin foil (if you're using foil be sure to give it a light coating of cooking spray or butter). In the bowl of a stand mixer, combine lemon zest, basil and sugar. Use your finger tips to rub zest and basil into sugar until moist and fragrant. Add melted butter and almond extract, using paddle attachment, beat until smooth. Add flour and salt; beat on low speed just until dough comes together on the paddle (it should be clumpy). Press dough evenly into bottom of prepared pan and refrigerate for about 10 minutes. Bake for about 18 minutes or until edges are golden brown and crust is slightly puffed. Remove from oven and set crust on a cooling rack. Leave oven set to 375 F.
Prepare filling; in a medium-size bowl, toss pitted cherries with 2 teaspoons of flour: set aside. Brown the butter: have a heatproof glass bowl on hand for the butter. In a large saucepan, melt butter over medium-low heat. Increase the heat to medium and, stirring occasionally, cook the butter until it turns golden brown and develops a nutty aroma. Depending on the stove's heat, it can take 5-8 minutes for the butter to brown properly. During this process the butter will first become foamy before changing color, making it difficult to see what's going on. Just be sure to give it a good stir now and then so that the butter doesn't burn. Once it's gorgeous and fragrant, remove the pan from the heat and transfer the butter to heat-proof bowl; set aside to cool slightly. In stand mixer bowl, fitted with whisk attachment, beat together the eggs, both sugars, salt and almond extract until mixture is smooth & light. Slowly add flour and beat until smooth. Gradually stream in the cooled brown butter and beat until well blended. Bake for about 30 minutes or until filling is golden and puffy. Remove pan from oven and place onto cooling rack. Cool completely before slicing. I just LOVE these gorgeous photos, those shadows are amazing. And these bars sound wonderful, all of the flavors! I so very much want to make/eat/all-of-the-things these! I love the flavor combination and the photos are ridiculously gorgeous! I can practically smells these baking in my oven. It's almost cherry season here, and this will be on my must-try list. I love your imagination - and I'll never look at the moon in exactly the same way again. Your unabashedly unkempt Edwardian girl sounds like the perfect summer playmate. I would invite her over for spiked punch and cherry squares, but she would find my garden a frumpy bore. My garden is the sagging Edwardian aunt, balding in patches, and no one can quite remember which side of the family she belongs to. Oh, how can one not be enchanted by Tom Hiddleston? :) I love the combination of cherries and almonds--I'm curious about the lemon basil addition. I bet rosemary would be just as delicious. These bars sound fantastic--an ode to summer. yum looks divine! thanks for the great recipe. I have missed your beautiful prose and visiting your pretty space (I know changes are afoot but I've always liked how your space looks). I share your enchantment for almond and cherry flavors and luckily, there are still cherries in my neck of the woods. I have to make these gorgeous bars! Valerie - you make the most amazing flavor combinations! This one is simply stunning! I've got 2 pounds of cherries waiting for me in the fridge, thanks for the lovely inspiration!